Eastbourne is a traditional seaside resort, boasting five miles of unspoilt beaches, palm tree lined promenades, four golf courses and Seaside Award clean sea. It offers fun for all of the family, from a skate festival to the annual air show, a visit to Eastbourne Pier or a chance to dance the night away to live music at the bandstand. Eastbourne is a natural gateway to the South Downs including national beauty spot Beachy Head. Being close to 1066 Country, Eastbourne is an ideal base for visiting castles, stately homes, vineyards, transport museums and exotic gardens across Sussex. Beachy Head, with its dramatic white cliffs and gently undulating downs, is an area of outstanding natural beauty and tranquillity which belies its proximity to the busy south eastern towns of England. It is a haven for those who like to walk or cycle. It's also a great place for hang-gliding, mountain boarding, or for the rather less extreme sport of flying a kite. Battle is a busy market town situated close to the site of the famous Battle of Hastings. The actual site of the battle was the Senlac field to the north of the seaside town of Hastings. Here you can experience the most famous date in English history, find out how the nation changed forever in October 1066 and discover the facts of the Norman Conquest in the very place it happened. Herstmonceaux Castle is a magnificent moated castle, set in beautiful parkland and superb Elizabethan gardens. Here you can experience the peace and tranquillity of this 15th century castle set among carefully maintained gardens and parkland. The castle is not open to the public; however guided tours are conducted from Sunday to Friday. Other facilities include a gift shop, visitor's centre, tea room, nature trail and children's woodland play area. Get your skates on and join the locals in their favourite pastime of roller-blading along the five mile stretch of promenade, from the peaceful Falling Sands to the bustling Sovereign Harbour Marina. Browse around the waterfront shops or relax in one of the continental style restaurants, cafes or bars at the harbour. Eastbourne has a thriving sailing and water sports scene. Have a splash at windsurfing and canoeing, or take a pleasure boat trip along the coast. Eastbourne Pier is the perfect family attraction. The pier is the hub of all activity on the seafront with visitors from all over the country making the pier their first port of call. Tens of thousands of people visit the pier during the day in the height of summer – and it’s no wonder with so much to enjoy. We have activities for all the family. Enjoy the stunning views of the seafront from the Camera Obscura, take a leisurely stroll around the shops, have lunch in the newly refurbished family bar. If that isn’t enough, the pier lights up at night with the town’s very best night club and bars. Even in the height of summer, the club’s air conditioning keeps the full house nice and cool. Sovereign Harbour Marina nestles peacefully in the beautiful South Downs at Eastbourne. Along with the excellent location, a range of first-class, 24 hour facilities and an unbeatable level of professional and helpful service are provided. The Waterfront, the superb harbour-side development of cafés, bars, restaurants and shops, provides a haven where boat-owners can relax. Eastbourne Miniature Steam Railway Park, Travel behind the famous one-eighth scale miniature locomotives as they meander for nearly a mile around the beautiful country park. Enjoy a pleasant stroll around the five-acre lake where nature and wildlife may be seen in their natural habitats or relax in the prize-winning tea gardens with a beverage, lunch or Cream Tea from the railway style cafe. Drusillas Zoo in Alfriston has hundreds of fascinating and entertaining creatures you can be certain there will be plenty of animal magic to enthral and excite everyone from the youngest to the oldest visitor! But animals are only half the fun at Drusillas Playland is paradise for anyone who needs to let off steam, packed with slides and swings, ropes and climbable things. Eastbourne, home of the Banoffi Pie, offers everything from 5 star dining and multi-cultural cuisine to the traditional seaside staple of Fish ‘n’ Chips and delicious ice cream. Even enjoy some more gastronomic delights with wine tasting at nearby vineyards, visit a cider farm, indulge in a Sussex cream tea, pop into a traditional country pub or visit a farm shop and stock up on fresh Sussex produce. The Counting House is a beautiful pub dating back to the 17th century and as such you can find cosy open fires to settle yourself down in front of to enjoy a pint or two, or perhaps a glass of wine. They also serve up excellent classic pub food and host regular film and quiz nights. Taboo is a modern style café bar aimed at the younger generation. As such you can enjoy a brightly coloured décor and dark wooden furniture. There are a good variety of drinks on offer at the bar and well as some tasty tapas dishes too. Slater’s Wine Bar is the place for a decent bottle of wine and plenty of choice of different wines available by the glass. Here you’ll find a convivial atmosphere in which to enjoy quality wine at reasonable prices. Bibendum is a restaurant with a separate and equally popular bar area. You can expect plenty of comfortable seating, modern décor and a great range of drinks. Food includes gourmet style dishes such as mussels in a fragrant coconut and lemongrass broth. 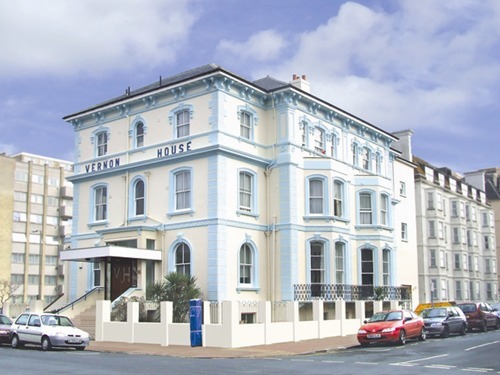 Eastbourne offers a range of accommodation from 5 star luxury to small and friendly guest houses. A natural gateway to the South Downs countryside, Eastbourne is also the ideal location to stay overnight when exploring Sussex villages, country parks, forests, vineyards, historic buildings and of course national beauty spot Beachy Head. Eastbourne by night offers the perfect place to either relax after a busy day of sightseeing or kick up your heels and dance the night away. Take in a West End musical or enjoy a Bandstand concert, everything from Rock n Roll to the Proms or a Classical 1812 with fireworks is available in Eastbourne. The Congress Theatre is a purpose built modern theatre and conference venue with a seating capacity of 1689. It has a licensed bar, and facilities for the disabled. The Winter Garden is a Grade II listed building, designed by architect Henry Currey and built in 1875. It consists of two main parts - the Floral Hall, originally used as a skating rink in winter and concert hall in summer, and the Gold Room. The Royal Hippodrome opened in 1883 as the New Theatre Royal and Opera House. It changed to the Royal Hippodrome in 1904 following refurbishment. The Royal Hippodrome was the home of Music Hall in Eastbourne for many years and has the longest running summer show in Britain. Eastbourne can be whatever you want it to be, if you want peace and tranquillity you can find it there but if you want the sea, sport and adventure that is there as well. Eastbourne is the ideal place to watch the world go by one minute and explore the area the next.